I have never seen a religious leader working for the workers before. I have never heard a talk about religion in a ‘lefty’ space before. Before coming to Brandeis, as an activist and lefty high schooler, I worked in several organizations including feminist and socialist groups in my hometown of Istanbul, Turkey. The spaces these organizations provided was secular, almost to the extent of anti-religiousness. Turkish left chose its side long ago between the war of the two major identities of Turkish Politics: seculars over Islamists. It is almost an unspoken rule to have a distance towards religion, particularly Islam, in the left, in Turkey. Coming to Brandeis University changed my view. At Brandeis I was introduced to a friendly space for all religions. On top of my knowledge of Islam, I learnt more about Judaism. I saw my friends fighting against injustices with their Jewish identity, emphasizing what their religion taught them and highlighting the motto of social justice all the time. It was then I realized how intersectionality was used by religious people, believers and spirituals for a call to unite and mobilize the masses. I was amazed. Then I started working at Massachusetts Interfaith Worker Justice. I saw even more how religion could play a role in mobilizing and uniting people. I heard Rev. Dr. William Barber and Rev. Dr. Liz Theoharis, religious leaders and co-chairs of Poor People’s Campaign, calling all for a moral revival, to fight and confront the enmeshed and inseparable evils of systemic racism and other forms of discrimination, poverty, the war economy, and ecological devastation. 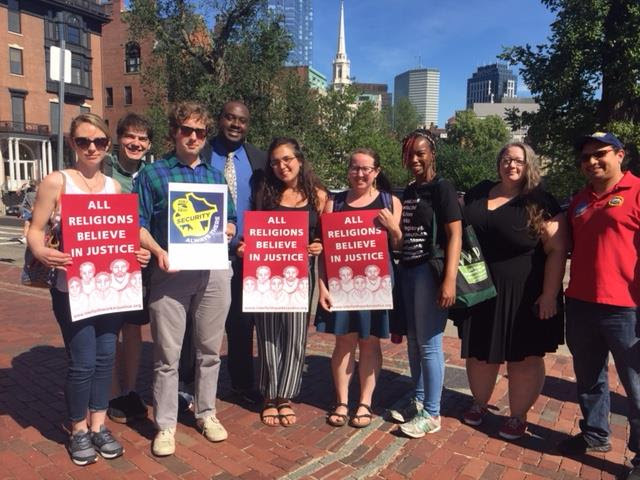 I talked with Sister Tess, an activist and e-board member of Mass IWJ, while she was participating in a huge Raise Up Massachusetts (RUM) rally in Massachusetts State House to demand paid family and medical leave and 15-dollar minimum wage. Once again, I saw the option of having religion and religious people in the action space and the talk. I saw how religion and its message could mobilize people. Now, by heart, I want my country and my people to include religion and religious people in the talk. I believe in the power of religion and its message to mobilize people.